Top 5 Family Fun Things To Do In Columbus, Ga. The Oxbow Meadows is a place where nature can be itself. Two walking trails wind between ponds taking hikers into the realm of native flora and fauna. 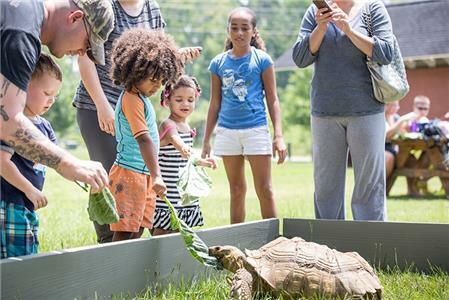 Between a science and history museum, two renowned performing arts complexes and an esteemed natural wildlife center, Columbus, Ga., bursts with family-fun. About an hour and a half south of Atlanta via I-85 and I-185, Columbus is the second largest city in the Peach State and offers an ideal family getaway. With so much to do, this thriving Georgia city is a boundless adventure for all. 1. Give the family an extraterrestrial experience without ever leaving planet Earth at the Cocoa-Cola Space Science Center. 4. Sail back through time at the National Civil War Museum located on the beautiful Chattahoochee River. This prestigious establishment is the only museum in the world dedicated to telling the complete naval story of the American Civil War. Start at the timeline exhibit, which takes guests month by month through the war. This exhibit shows all naval events and features many of the museum's rarest artifacts, such as the uniform coat of Captain Catesby Jones and Admiral Farragut's two-star hat insignia. Get up close to the largest surviving Confederate Warship, the CSS Jackson and take in the wreckage of the CSS Chattahoochee. Climb aboard the full-scale replicas of the USS Waterwitch and the USS Hartford. This museum is also home to the largest collection of U.S. Civil War naval related flags in the country. The stories of the sailors and soldiers, both free and enslaved, at Port Columbus leave an indelible mark on all who visit. The museum is open Sunday and Monday from 12:30-4:30 p.m. and Tuesday-Saturday from 10 a.m.-4:30 p.m. Tickets are $7.50 with discounted rates for military, seniors and students; children are free. 5. Located in the heart of historic Uptown Columbus, the RiverCenter for the Performing Arts is the centerpiece of the city's arts and entertainment district. This 245,000-square-foot facility is five stories high and is a visually stunning blend of the past and present, mixing the brick and ironwork of the area's historic buildings with a modern multi-level glass and steel façade. RiverCenter's state-of-the-art facilities include the 2,000-seat Bill Heard Theatre, the 430-seat Legacy Hall and the 180-seat Studio Theatre. The center has hosted a variety of world-renowned performers, including classical artists such as Jessie Norman, popular entertainers such as Bill Cosby and Jerry Seinfeld; international ensembles such as the Israel Philharmonic Orchestra; and, national touring productions such as the Broadway shows "Chicago" and "Rent." This year, enjoy Shakespearian plays, robust orchestra performances and Broadway hits like "Mama Mia!" and "Cinderella." A show at the RiverCenter will give your family a cultural experience they won't forget. Visit www.RiverCenter.org for a full list of shows. Columbus offers family-fun that enriches the mind, a break for the soul and memories to last. After a trip to this Southern charmer, the entire carload will want to turn back around for more.